Log into your School-Day account. For more information about Logging Into School-Day , click on the link provided or see related articles. For more information about Creating An Account, click on the link provided or see related articles. You have three available options for adding a student. 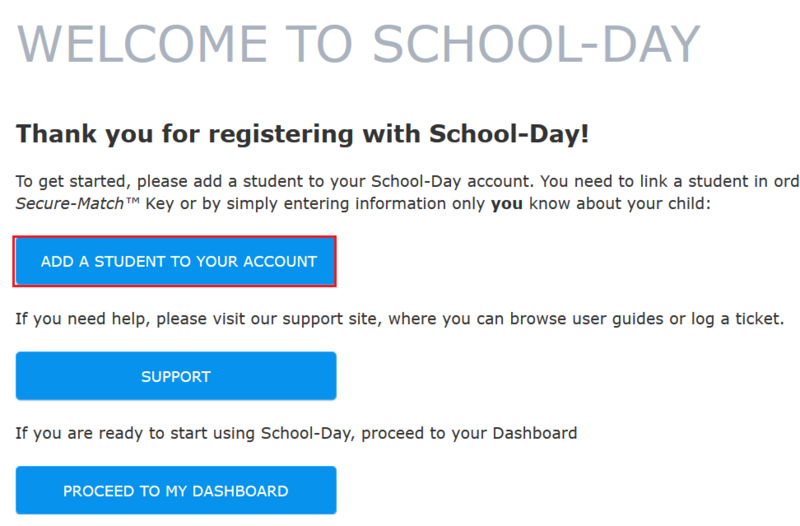 If you have just created your account, click on Add A Student To Your Account from the Welcome To School-Day screen. 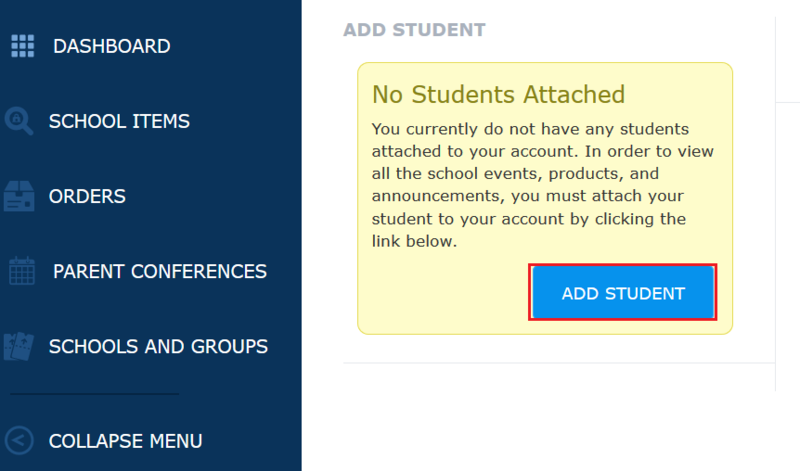 If you already have an account, but do not have a student linked to your account, click on the Add Student button from your dashboard. Or click the Add symbol in the bottom left corner of the dashboard and then click Student. Click on the Electronic Authentication link. This will take you to a form asking you to provide several pieces of information about your student. Select the School Board for your student. Please note, not all School Boards use Electronic Authentication. 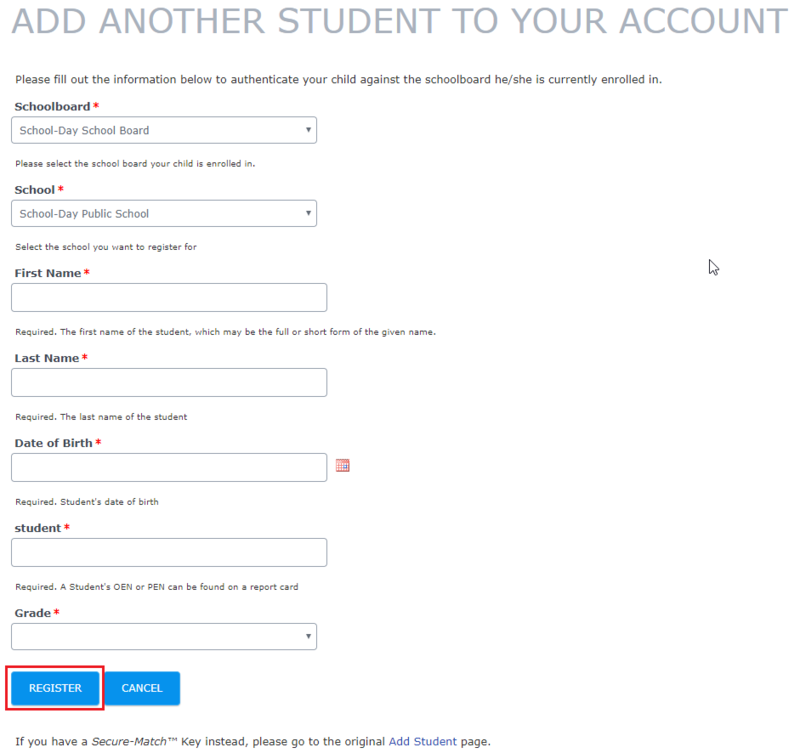 If after selecting your School Board the following message is displayed, you can only add your student for this School Board using the Secure-Match™ Key method. For more information about Adding a Student using a Secure-Match Key, click on the link provided or see related articles. Next, fill in your specific student’s information, and click Register when complete. The information required may vary from School Board to School Board. Electronic Authentication information is encrypted. School-Day has no visibility of the information required for successful Electronic Authentication. Please note, the information you enter must match the encrypted information exactly. If it doesn't match, it will not work. For example, a School Board may have a student's abbreviated name on record, but a parent may enter their full name, or vice versa. If there is a discrepancy, this would result in a failed match. If you cannot complete an Electronic Authentication, please contact your school administrator for a Secure-Match™ Key. You will be informed of successful completion. Click Dashboard to begin using School-Day. If you would like to add another student, select Add Student, or the Add symbol as in step 3, and repeat the process. Multiple students can be linked to one Parent account.